An anti-immigrant group staged a fake Islamic State (IS, formerly ISIS/ISIL) attack in Prague’s center that, unsurprisingly, ignited a chaotic panic among the crowd, resulting in “several tourists” being injured. 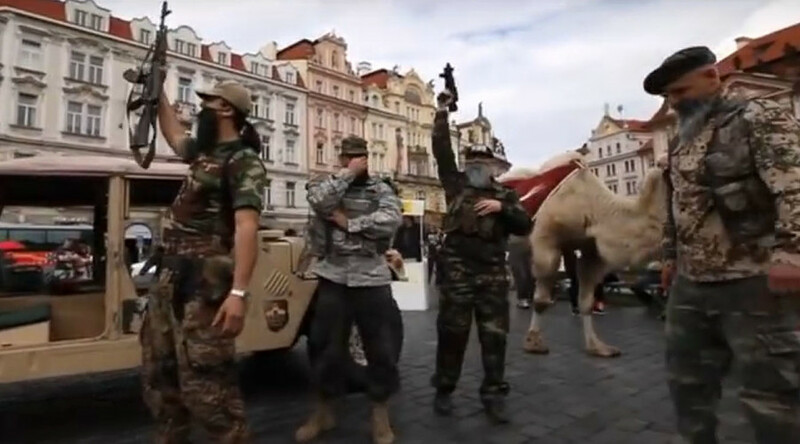 The group entered the Old Town Square equipped with an Islamic State flag, a military vehicle, army clothing, a camel, stick-on beards and fake guns which they fired in the air while shouting Allahu Akbar. Police had given the planned demonstration their approval, but stopped the performance just before the group were going to play out a public execution of “prisoners”, because several tourists mistook the blanks for genuine gunfire and became panicked. The activists say they were trying to demonstrate how their country would look and feel under Muslim rule. "I'm from Belgium and I'm telling you, it is very dangerous," said one tourist to Czech newspaper Ceske Noviny. A police spokesman told Ceske Noviny that people who didn’t know it was a demonstration, thought it was a real terrorist attack and hid in the square fearing for their lives, some said they ran into nearby restaurants’ kitchens for cover. The group’s leader Konvicka Martin claimed the exercise was a total success and took to Facebook to slam reports of any distress among the crowd. “Until a few Muslims started shouting aggressively and push towards the performers, everything went very peacefully,” he wrote.